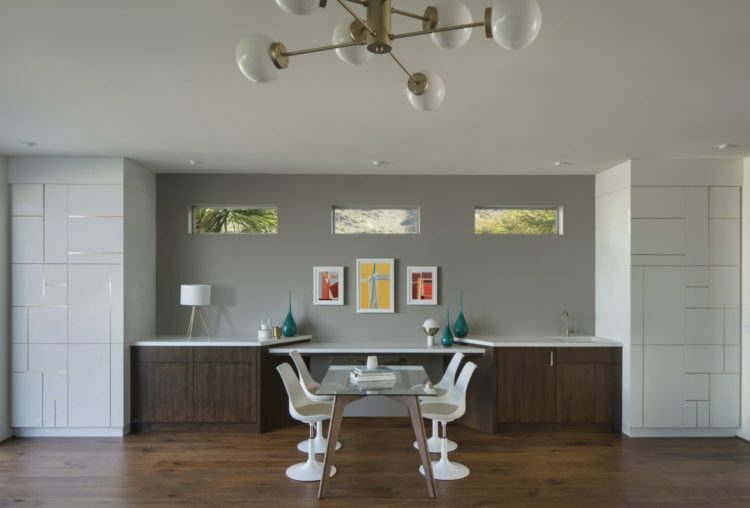 Angelica Henry of Scottsdale’s Angelica Henry Design takes us through a super-stylish Mid-Century Modern bonus room addition in Paradise Valley. This Mid-Century Modern bonus room addition is the ideal place for this growing young family to unwind, entertain, play or study! The stair railing, composed of stainless cables and a wood hand rail, creates a more open quality to the space and stairwell and also gives visitors a sneak peak at the room. Durable wallcovering is used on the tall stairwell well in order to stand up to the swoosh of backpacks, little handprints and general circulation in this high-traffic space. 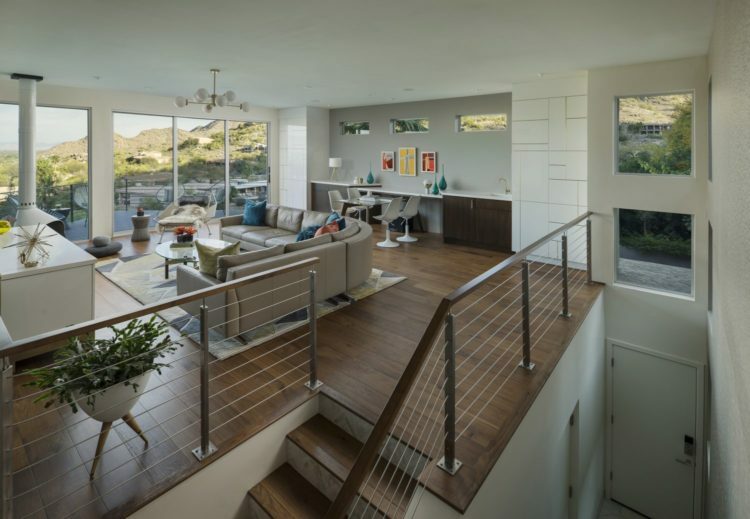 Large windows and sliding doors maintain the stunning views. Client requirements included a wide range of functions including wet bar, study area, built-in toy storage, an open play space and a TV sitting area all while maintaining durability. Integrating many of these functions into a single unit proved a challenge. This was accomplished by flanking the main wall with two Mondrian inspired cabinets. The left unit is a toy cabinet with roll-outs and toy bins. The right unit is wet bar storage for glasses, bottles and sundries. A study area anchors the center and the table can be pushed under the counter to gain floor space or pulled out to gain work space. A large sectional sofa provides plenty of space for the family and friends to lounge, watch TV and enjoy the stunning mountain views. White lacquer millwork with brass inlays infuse light against the warm walnut wood tones. 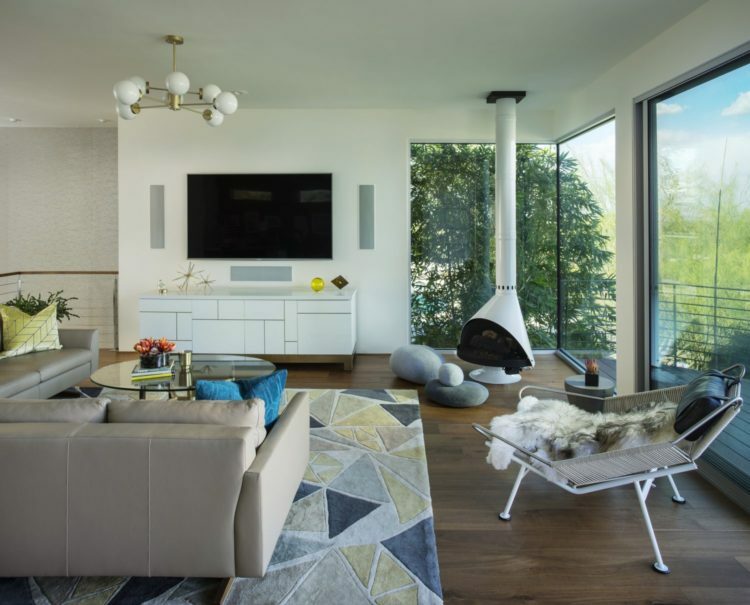 Quirky but durable furnishings including pebble shaped floor pillows give this space a lighthearted quality while a retro cone-shaped fireplace radiates warmth into the room. The chandelier floats above the seating group and adds an irregular geometry to the room which complements the area rug.